2014 NASCAR rules packages: Good for the No. 48? Jimmie Johnson, driver of the No. 48 Lowe's/Kobalt Tools Chevrolet, celebrates after winning the series championship. NASCAR released their 2014 rules packages to the teams this week. Obviously from the owners on down within the organization there was concern, especially when you know that there is change coming, but to what extent you didn’t know. If you were good before these changes were released, you don’t want to lose that edge to your competition. If you don’t have the resources or the depth in your engineering, then obviously you would really have been dreading what NASCAR was going to do because your fear would have been that the gap between you and the lead teams would actually get wider instead of tighter. If you are everyone but the No. 48 car, you aren.’t going to be happy just knowing that with these changes you will be able to get caught up. You want to not only get caught up but get ahead. Remember, just staying even with the No. 48 doesn’t put you ahead of the No. 48. Our newly crowned six-time NASCAR champion and his team are really enjoying the view from the top of the mountain. So there was definitely concern going into this week following the test at Charlotte Motor Speedway. There’s always concern when even subtle changes can upset the existing balance of the race car. When you have it figured out, like the No. 48 has, you don’t want anybody to make any changes. I applaud NASCAR for only making some minor tweaks. This is a time you want to not only be working but also resting and enjoying the holidays. Let’s face it, these last two years have been hard on these teams. We went from the switch more than two years ago to electronic fuel injection which was a major change in our sport, to this year with the introduction literally of a whole new car. These guys need some downtime instead of having to reinvent the wheel for a third consecutive year. You hear us talk all the time that just because we get a couple of weeks off for the holidays from getting on an airplane every week, doesn’t mean these teams are not still working. Trust me they are working hard. The key to being successful in all three of NASCAR’s major touring divisions is simple. It’s called preparation. It might sound simple but it’s actually really not. Right now is the key to everyone’s 2014 success or failure. How prepared you are coming out of the holidays, going into testing in Daytona in early January and then right up until it’s time to go back for 2014 Speed Weeks is all happening now. A great example of that is once again the No. 48. They are the gold standard in our sport. They won five consecutive championships. In the 2011 championship, they were a player but still it came down to Tony Stewart and Carl Edwards. In 2012, the championship was there for the taking, but problems in our last two races at Phoenix and Homestead crippled the No. 48 and the championship slipped through their fingers. You then saw the No. 48 come to Daytona in February locked, cocked and ready to rock. They won the Daytona 500. That sent notice immediately through the garage that they were back in fine form. It carried them for the next 10 months all the way to Homestead and then to the head table at the NASCAR Awards Banquet to yet another history making end of the season. 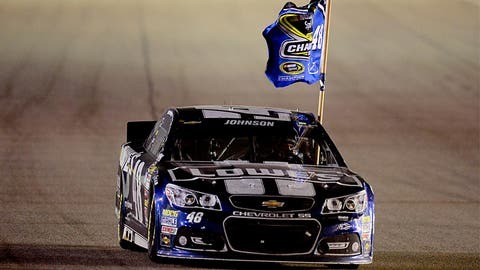 Jimmie Johnson joined only Richard Petty and Dale Earnhardt as only the third driver in the entire history of our sport to win six or more NASCAR Sprint Cup championships. You can find no better example of how preparation equates to success than when looking at the No. 48. Now the question becomes can they take the new 2014 rules package, maximize it within their cars and take yet another history-making step to add a seventh championship to their crown?